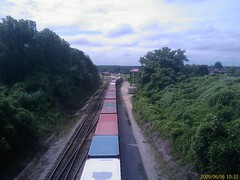 Hamlet, NC is a great place to go watch the trains pass, although today was kind of slow. You can usually see 15+ trains on a good day. A lot of freights come by the station. Make sure you check out the station, they have a nice model train setup of the area. 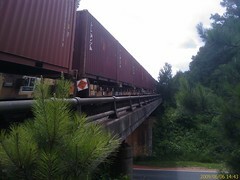 West of Hamlet, NC there is a nice quiet road where a person can sit and watch the freight traffic from the Hamlet yard come and go. Its in PeeDee just west of the PeeDee River. The picture was taken near a bridge that passes over a local road.